I found Godforsaken instantly engaging. I loved the cohesiveness and organization of D’Souza’s writing and the grace of his arguments. So why did I strongly dislike this book? Because his theology and worldview lack basic biblical understanding. 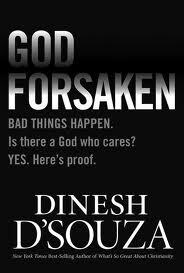 Before D’Souza expresses his own ideas, he argues in agreement with the atheists that the Christian concept of original sin and the events of Genesis are not enough to explain why suffering exists today. The problem with his argument is that his worldview is not the Christian one–at least, not the one I see in the Bible. His academically inspired, secular theology continues in pieces throughout the book–as well as some solid theology and truly interesting points. I personally can’t separate God’s creation of the world from the gospel–but that aside… Even if the biblical creation account was a myth, there are elements of the story that can’t be ignored, including the transfer of the dominion of the earth. The Genesis account tells that God gave dominion of the earth to Adam and Eve, but that a fallen angel disguised as a serpent tricks the humans to give up their birthright in exchange for worldly knowledge. Satan has since been the ruler of the earth, but because of Jesus’s sacrifice on the cross and resurrection from death, Christians have authority over sin and the realms of darkness. Darkness and suffering are not yet gone, but Christians can experience the fruit of the Spirit even in the worst of physical circumstances because nothing can separate us from the love of Christ. At Jesus’s second coming, suffering will be removed from the earth altogether and God will tabernacle on a cleansed earth with those who love Him. In the meantime, evil must fully blossom before it can be removed–so we can expect suffering to increase before the second coming (and also for a corresponding revival of the Holy Spirit). D’Souza’s ideas were interesting, but I’m unsure who his target audience is. This isn’t a book for traditional Bible believing Christians. It might be of interest to an agnostic or unsure atheist, but I couldn’t recommend any new believer becoming a Christian without a solid biblical foundation, and this isn’t it. I personally can’t see this book benefiting anyone. Spirit Wars is one of the best books I’ve read in awhile. It is short and simple, but I was deeply impacted by Kris Vallotton’s encouragement, personal stories, the way he presents the truth of the gospel, and his insight into the supernatural realm. Early on in the book, he uses the metaphor of a haunted house to show how many Christians are deceived into believing they are in a war with their flesh. As Christians, we know that ghosts of past residents do not haunt houses–rather, ghosts are demons that sometimes pose as real or deceased people, and those demons are the ones doing the haunting. Likewise, when we believe we are struggling against our sinful flesh, it cannot actually be our flesh if we’ve repented and become a born-again believer in Jesus. Our sinful nature died on the cross with Jesus and we were resurrected with Him, so any current struggle is no longer with the dead self, but with demons who try to impersonate our former state. Our flesh is weak, but it is no longer corrupt. I found this metaphor so powerful that it’s been easier than ever for me to take every thought captive and live in uninterrupted freedom. I also loved the way Kris describes our triune being (soul, spirit, body). A few years ago I was diagnosed with a chronic illness, and have spent so much energy on my body (eating, sleeping, exercising) that I hadn’t considered that focusing my attention away from my body might be just what I need. For the last couple weeks, I’ve made it my priority to laugh more, find fun things to do, and to be a bit looser with dealing with my body (still being mindful of good health, of course). It’s been going great! Kris’s situation and stories are completely different from my experience, and yet his stories and teaching triggered me to think outside the box so that I could better hear what the Holy Spirit was guiding me to do. I appreciate how his writing is so conversational and easy to relate to–despite the differences in our circumstances. 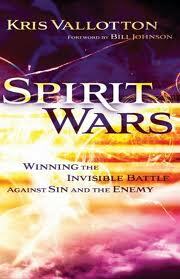 There are other books that deal more thoroughly with deliverance/sozo ministry (I particularly recommend the author Neil T. Anderson, as many of his books encouraged me after my own deliverance experience), but Spirit Wars is special in that it’s clear, concise, and accessible, without lacking in depth or impact. I think every Christian could benefit from reading this book. When former Olympian Trevor MacDaniel rescues a toddler from a mountain lion attack, his life entwines with the child’s aunt Natalie. Natalie has a gift for seeing deep into people’s souls–it’s so powerful for her, she can hardly look at people and can only remove the images and feelings she sees through her gift of sculpting. Together, Natalie and Trevor’s friendship helps each of them work through their wounds to find courage and peace. Meanwhile, strange and evil things begin happening, and Trevor and Natalie find themselves right in the middle of it. I’m surprised so many people like this book. I just couldn’t get into it. I did enjoy the major characters and the way they interacted, and Heitzmann did an excellent job portraying the personalities of the characters through their unique artistic and athletic abilities. But I otherwise did not enjoy the storytelling. The grammar and syntax were sloppy (and distracting) in many places (especially in multiple character scenes). I did not find the story suspenseful (the ending, in fact, was a bit anti-climactic). And I especially disliked her attempt to parallel the antagonist’s journey with Milton’s Paradise Lost. After each chapter were mini chapters from the antagonist’s perspective, each beginning with a stanza from Paradise Lost, then describing the villain’s activity in a terribly written poetic prose. I think these short chapters intended to build the suspense and mystery that evil was on the move. Personally, I thought they were so poorly written that it killed any bit of suspense. I was distracted by the grammar and found many of the Paradise Lost quotes to be contextually misplaced. I’ve noticed that a handful of other reviewers greatly enjoyed the addition of Paradise Lost, which makes me wonder how many of them have actually read it! 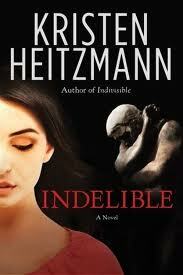 I actually think Indelible could have been more successful as a romance novel. There were many romantic elements between Trevor and Natalie and also several of the minor characters; and the health (or dysfunction) of relationships in general was very central to the story line. Heitzmann did such a good job with the internal story and character development that it’s unfortunate the suspense plot line, poor attempts to be poetic, and weird Paradise Lost references had to get in the way.